The summer residence of the Russian tsars, which is also referred to as the "Russian Versailles," is a beautiful and romantic place to spend a weekend. 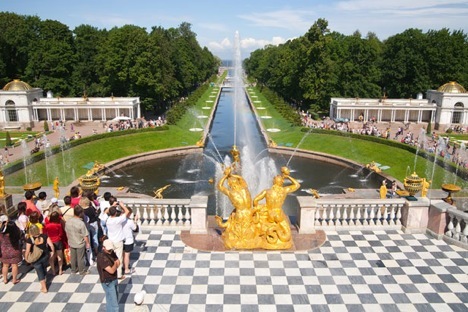 Peterhof is a town 47 kilometres from St. Petersburg. In the 18th and 19th centuries it was the summer residence of the Russian tsars and for this reason it sometimes is referred to as the "Russian Versailles". The palace-ensemble, along with the city center, is recognised as a UNESCO World Heritage Site. The estate itself (also known as “Versailles of the North”), with its shimmering golden fountains, was built at the behest of Czar Peter the Great as a non-stop party place. Friday evening is best spent at the romantic Alexandria English Park, with its picturesque bridges and toy-like, Neo-Gothic buildings. Here you can take a look at the Farm Palace, the Gothic Chapel, and the Cottage Palace that served as the imperial family’s summer residence from the reign of Nicholas I. Entrance to all three properties costs $48 (€36). The best place to have dinner is at Cafe Romance (at 27 St. Petersburg Avenue), which offers Russian and European cuisine in delightful, Russian Doll-style surroundings that combine folk revival motifs with contemporary design. Expect to pay around $27 (€20) per person. Take an evening stroll back to the city center and the 230-foot Peter and Paul Cathedral. The cathedral was built in the fairytale-like, Russian Revival style by the architect N. Sultanov, at the behest of Czar Alexander III. To kick off your day in style, head down to the Lower Park via the Palace Square entrance or Razvodnaya Street. Here, from the terrace of the Grand Palace, you can get a great view of the entire park, right up to the Gulf of Finland. The spectacular view is topped off by the Grand Cascade and the Golden Statue of Samson, which both fire off silver fountain jets 65 feet high into the air. Entrance costs $13 (€10). If you head east down the steps next to the canal and turn right, you will find yourself outside an historic building that houses the Bolshaya Oranzhereya (“Grand Orchard”) restaurant. For about $15 (€11), you can have a cup of coffee and grab a light breakfast on the summer terrace, with a view of the fountain. After breakfast, continue east until you meet the Chessboard Cascade, which is decorated with ornate Chinese dragons. The alley between the Roman Fountains — copies of the fountains on St. Peter’s Square in Vatican City — takes you deeper into the park and toward the banks of the Gulf of Finland. Monplaisir Palace was Peter the Great’s favorite, with an open-air terrace right on the sea shore. This baroque building houses an art gallery, as well as a collection of Chinese porcelain and pottery. The Bath Block is located nearby: It hosts a museum of the riches of Czar Peter’s time, including shining kitchen silverware, all kinds of grandiose feasts, fountains and a Chinese Garden. The interior of the Catherine Block, designed by architect Giacomo Quarenghi, is an example of the Empire style (be careful, the floor is extremely slippery). Entrance to the three museums costs $37 (€28). Moving along the main alleyway will take you to the western part of the park and past the Adam and Eve Fountains, which have been preserved from the time of Peter the Great. The Hermitage Pavilion: Peter had the idea of building a “quiet corner” after visiting East Prussia. The building is surrounded by a moat, which was once connected to land by a drawbridge that would only be let down for those lucky enough to be invited to special lunches. The museum features a mechanical table that allowed guests to communicate through a cable with the chef on the floor below. The table was lowered and lifted to ensure that guests could enjoy privacy without the servants interrupting. Entrance to the museum is $6 (€4.60). Marly Palace is situated nearby. It was built in the 1720s and is named after Marly-Le-Roi — a residence of King Louis XIV of France that Peter once visited. 1. On the Meteor river tram. It sets off from the Palace Embankment opposite the Hermitage every 30 minutes, from 9:30 a.m. to 4:30 p.m. Travel time is 30 minutes. Single tickets cost $13 (€10) per person. 2. By minibus number 103 from Leninsky Prospekt metro station. Travel time is 30 minutes. Single tickets cost $2 (€1.50) per person. The palace stands on a specially made bridge, in between two ponds that were used for breeding fish; a ringing bell used to tell the fish that it was feeding time. Visitors today can go fishing in the ponds. The palace also houses Peter’s personal possessions and his collection of paintings. Entrance costs $6 (€4.60). There is much to see in the area around the Hermitage and Marly Palace: the unusual landscape design, for example, with its banked ground blocking this “oasis” of artfully trimmed bushes and fountains from the winds of the Gulf of Finland. Photographers enjoy taking pictures of the trees here, which are trimmed to look like balls. Have lunch at the Shtandart Russian restaurant on the beach by the central conduit. You can sample the same dishes that Peter would have offered his guests at feasts — dishes such as bear meat chops and elk stew. Expect to pay between $27 (€21) and $62 (€46), depending on how exotic your meal is. After lunch, you can rest on the beach and gaze out at the sea. You might also want to check out the Imperial Yachts Museum, or take a stroll to the historical Aviaries, to which a number of bird species and other animals have been returned in recent times. You can wander through the alleyways and labyrinths of bushes, in search of fountains that will drench you like a tropical downpour — and you will definitely need it in the hot summer months. Badly damaged during World War II, the Peterhof Grand Palace was reconstructed between the 1960s and the 1980s. Almost every czar and empress made some kind of change or alteration to the building. The rooms and halls in the palace — which include the imposing Oak Cabinet and the gilded Ballroom of many mirrors from the time of Empress Elizabeth — are so numerous that you are unlikely to spend a great deal of time in any one of them. You can also take tours to the Special Storeroom and the grotto beneath the Grand Cascade. Tickets start at $17 (€13). Audio guides are available for $15 (€11). Dine at the Samson Restaurant opposite the park at 44 St. Petersburg Avenue. Samson continues the tradition of the restaurant of the same name that opened on this spot in 1839. There is mostly Russian fare here, with numerous meat and fish dishes. A typical dinner here will likely set you back at least $31 (€23). At the Cafe Vienna, you can have a reasonably priced breakfast of sweet dumplings or fried eggs and bacon for around $7 (€5). The Tsaritsyn Pavilion was built in the 1840s by Andrei Stackenschneider for Alexandra Fyodorovna, wife of Czar Nicholas I. It was designed in the form of the ancient villas of Pompeii, complete with an atrium, a swimming pool and fresco paintings. A marble sculpture, fountains, “ruins” and peacocks strolling around the rose bushes all add to the decidedly Italian atmosphere. This pavilion was also designed by Andrei Stackenschneider and was a present from Alexandra Fyodorovna to her daughter Olga. It is reminiscent of the buildings in Palermo, with a sculpture and water drains that resemble mythical animals. A romantic staircase connects the tower to the surrounding gardens. Entrance to the pavilions costs $17 (€13). This museum — the only one of its kind in Russia — contains 8,000 exhibits, from one of the earliest decks of cards ever discovered (the “Peddler’s Deck,” Germany, 1690) to Soviet “prison cards” made from newspapers. Tickets cost $6 (€4.60). This collection is made up of gifts and bequests from the famous Leningrad art collectors Timofeyev and Ezrakh. It includes European porcelain, and Russian and early-Soviet art from the 19th and 20th centuries from painters such as Petrov-Vodkin, Ostroumova-Lebedeva, Borisov-Musatov, Roerich, Nesterov and Kustodiev. The collection also includes sketches made by the old masters of the French and Italian schools of the 16th–19th centuries. The Bicycle Museum is located in one of Peterhof’s oldest stone buildings (built in 1796) and features 12 bicycles that were used at one point or another by the Russian royal families to ride around the estate. The museum also houses related accessories and photographs. Tickets to the museum cost $6 (€4.60). This museum is dedicated to the creative history of the Benois Family — a dynasty of more than one dozen remarkable architects, artists, sculptors, theatrical designers and musicians. It is located in the former Ladies-in-Waiting Block, which was built by Nicolas Benois. Tickets cost $6 (€4.60). This is your last chance to buy some souvenirs (widely available in and around the Grand Palace) and get your hands on a miniature-sized replica of Samson or a photo album. Expect to pay at least $15 (€11). Take a late lunch at the Bavarian Restaurant (at 34 St. Petersburg Avenue), which offers German and European cuisine, tasty beer, coffee and desserts. A three-course meal will set you back around $31 (€23).